Welcome to the brand new Power BI Notification Center! We've added a notification feed to your Power BI menu. Open it to see important information we think you won’t want to miss. For example, your co-worker shared a new dashboard with you, or a new dashboard was added to your group space. On the web or on your mobile device… regardless which is your favorite Power BI platform, Power BI will push notifications to all of them. Even when you're on the go, your notification feed will keep you up-to-date. Ready to try it out? Notifications are already live in the Power BI service. For mobile, download the new version from the Apple Store, Google Play, and Windows store. When you log in to Power BI, any new notifications that were sent to you while you were offline are added to your feed. If you have new notifications, Power BI displays a yellow bubble with the number of new items. Open your Notification Center to see notifications displayed with the most-recent on top and unread messages highlighted. Notifications are retained for 90 days, unless you delete them sooner or reach the maximum limit of 100. If you’re busy, there is no rush to react to the alerts immediately. Check at your own convenience. You can turn mobile notifications on or off at your preference. 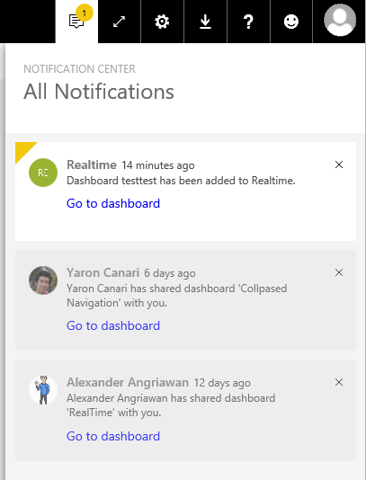 We are adding more types of notifications to better support Power BI operations and real-time capabilities. 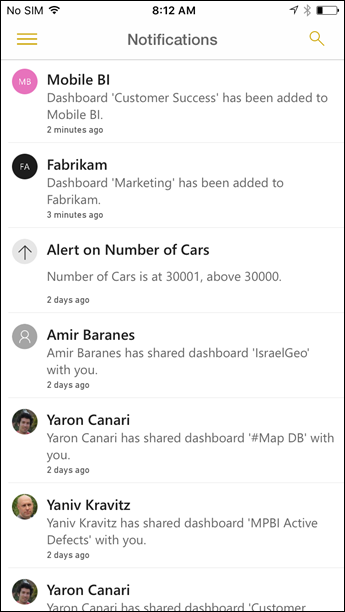 Data-driven alerts will be supported soon on all the Power BI platforms. You may have already seen this feature in your mobile device; it’s coming to the web as well. Expect more product level notifications, including new feature announcements, special offers, Power BI related activities, etc.